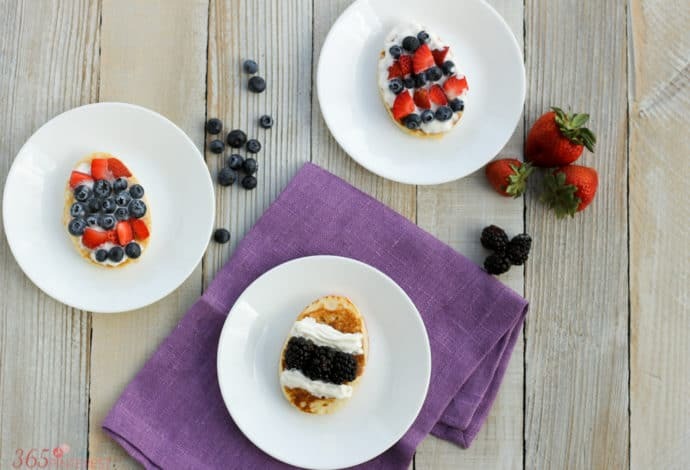 Looking for a last minute idea for Easter breakfast? 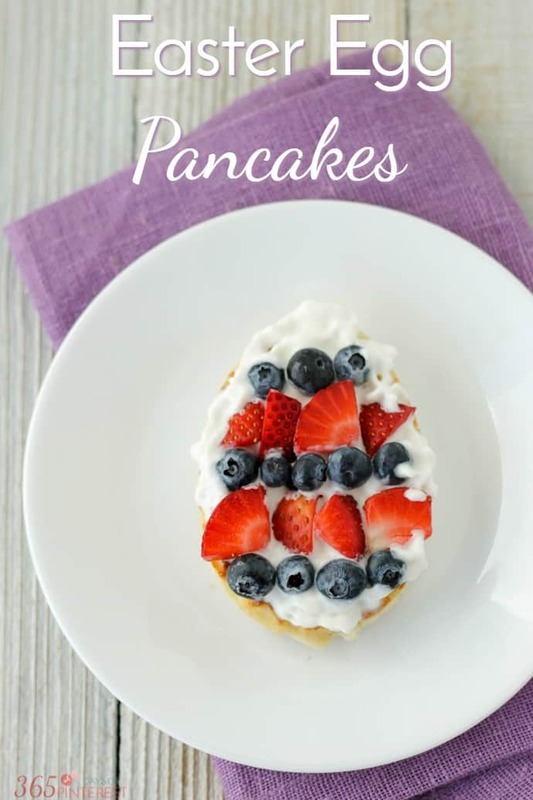 Easter Egg Pancakes are easy to make and covered in fresh fruit! We are very busy on Easter morning, so a special breakfast isn’t anything I’ve ever done. I give the boys an Easter basket in the morning and we usually save the egg hunt for after church and before Sunday dinner with all the family. But my kids loved my Reindeer Pancakes, and we had such fun making Groundhog Pancakes, so I figured I ought to try something for Easter! Naturally, I thought I would make Easter bunny pancakes, but when I saw a delicious Easter Egg Fruit Pizza on Persnickety Plates, it inspired me to try something similar in pancake form. These came together quickly, and the boys thought it was fun to “decorate” their eggs with different kinds of fruit. I used strawberries, blueberries and blackberries. 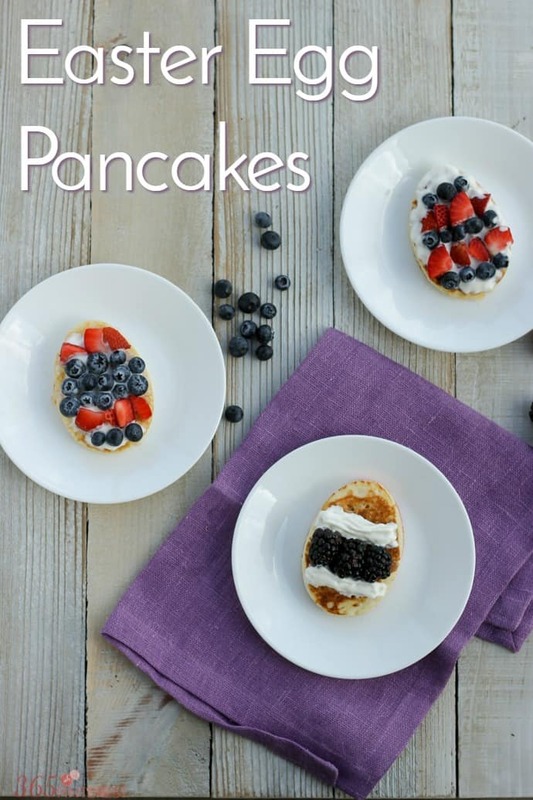 First, mix up your pancake batter. 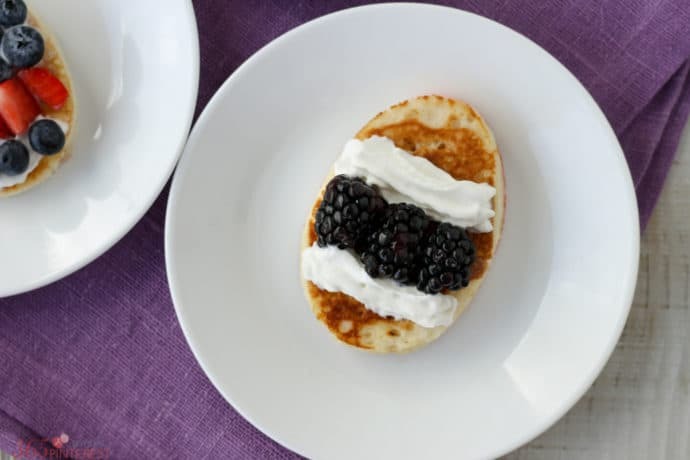 To make them egg-shaped, generously spray the inside of the cookie with cooking spray and then set it metal side down on the griddle. Pour the batter inside and leave it cook until the batter is puffy and dry around the edges. Slowly lift up the cookie cutter to remove and then flip the pancake to finish cooking. LET COOL before adding any whipped cream, or you’ll have a runny mess on your hands. Literally. 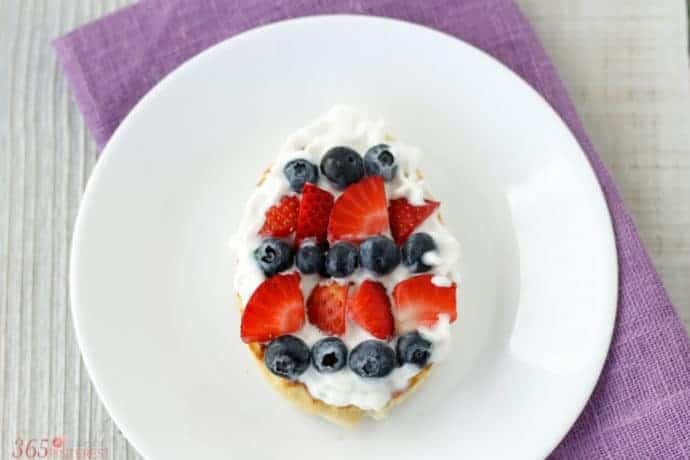 😉 Decorate with fresh fruit and dig in! A little extra treat like this is what makes holidays extra special. I love when my boys say things like, “Remember the time we made groundhog pancakes? That was fun.” That’s all I want for my boys-special, every-day memories. Happy Easter!